Two intrepid walkers joined us for our first Night Time navigation course on Big Moor above Curbur Edge in the Derbyshire Peak District. Mike set a challenging course, but all felt they had gained a great deal of confidence in their ability to use the navigation skills they had learned on earlier courses, and actually enjoyed the experience of walking on open moorland in the dark. The group met at Barber Booth car park near Edale for a 9.30am start. Jane, Mike and four students. The aim of the day is to ensure that the students are happy to cross open moorland in poor visibility, feel comfortable on steep ground and are able to locate small objects on the moorland using micro navigation techniques. The group ascended onto the Kinder Scout Plateau by following Crowden Brook. The brook is crossed several times before the final steep ascent by Crowden Tower to where the “edge path” is reached. Using a combination of pacing, timing and following compass bearings, two aircraft wrecks were located successfully. Mike had been suffering from and Achilles Tendon injury for a couple of months and we decided to see if he was recovered enough to lead a navigation course in a weeks time. 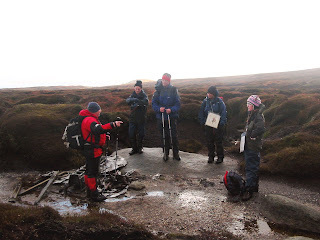 We run six "intermediate" navigation courses a year up on Kinder Scout. To make the day more interesting we set the group looking a task of locating various aircraft wrecks in on an otherwise fairly featureless plateau. We set out from Barber Booth car park at 8.30am and ascended up onto Kinder via Crowden Brook. Crowden Brook offers a fine scramble at its top though care needs to be exercised if the stream is in spate or the rocks icy. We followed the edge path eastwards to where we located ourselves at a stream junction which became our "hand rail" to locate the first aircraft wreck. (SK 10111 87854). Our bearing brought us directly over the wreckage of the Avro Anson. The weather forecasts had been a bit optimistic and instead of the predicted cloud free tops we were walking in cloud and a strong North Easterly wind that got stronger as the day progressed. From the first wreck we had a long stretch following the compass to locate the next one. Jane worked the compass whilst Mike counted the paces. Interestingly, because the mist was so thick, we couldn't see or take any easier terrain options so followed the bearing as near accurate as possible. The mist cleared as we finished our pacing, over 500m, to reveal that we were less than 10m away from our objective, (SK 10158 88241) a Dragon Rapide. With two objectives found in the mist, "we were on a roll" and kept to the system of Jane walking the bearing and Mike counting the pacing. Our next objective was Crowden Head (632m asl), before dropping into the River Kinder and on to Kinder Gates (SK 08800 88684) where we had a hot drink and some much needed food. The wind was becoming stronger so our break was cut short. We came out of the mist shortly before Kinder Downfall, though because of the wind we did not linger to take in the view as the River Kinder drops impressively down a rocky waterfall. Instead we picked up the edge path and headed south towards our next objective, the wreck of Hampden AE381 that lies hidden though only 10m from the path. (SK 07803 87494). The NE wind was now very strong, and although behind us was getting unpleasant. We decided to head directly to the Jacobs Ladder path (via Kinder Low Trig. point) for our descent. We arrived back at the car 5 hours after we started. A pint or two of Butcombe Gold was then consumed in the Rambler's Inn at Edale.